There are about 10 million of Armenians and 7 million of Bulgarians in the world. I just have had a nice Armenian female student in my class, Loucine. She is from Syria. A few years ago I had a small business for a year. The owner of the neighboring business was a very nice Bulgarian man. These two good people inspired me to create these two videos in commemoration of their cultures. Today, December 28, 2018, I cleaned the first trash from the site. This is a personal site of an educator. No solicitations, please. Merry Christmas and Happy New (2019) Year! 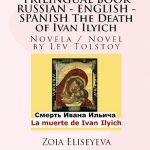 El libro trilingüe – ruso, inglés, español: el cuento completo del clásico ruso A.P. 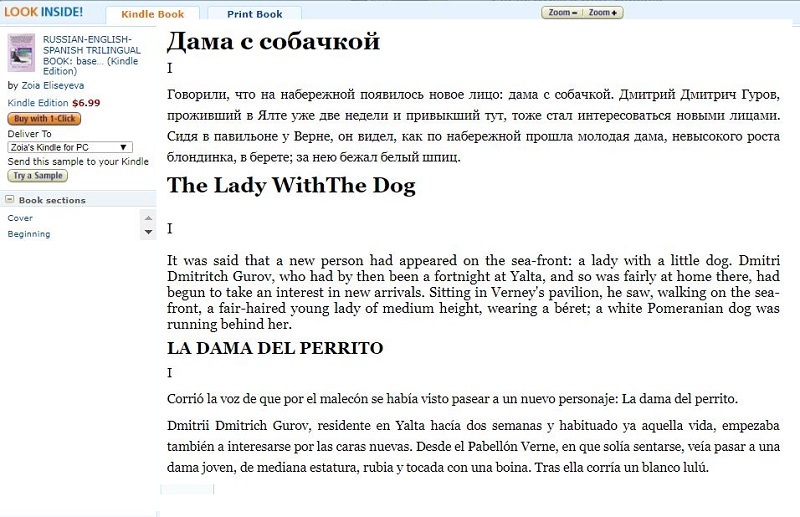 Chekhov “La dama del perrito”, algunas notas culturales (de cultura rusa) sobre del texto, y la comparación de los rasgos de gramática de tres idiomas (la comparación es en inglés).Cada página del cuento tiene un párrafo del texto en tres idiomas. Es muy conveniente para comparar los idiomas. 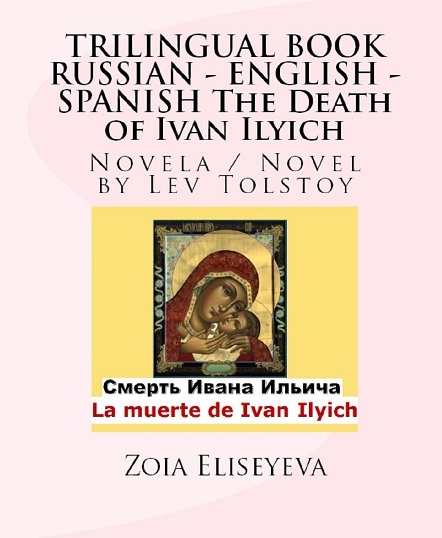 The trilingual book – RUS-ENG-SPAN – presents the complete classical story by A.P. Chekhov “The lady with the dog” about love in extra-marital affair. 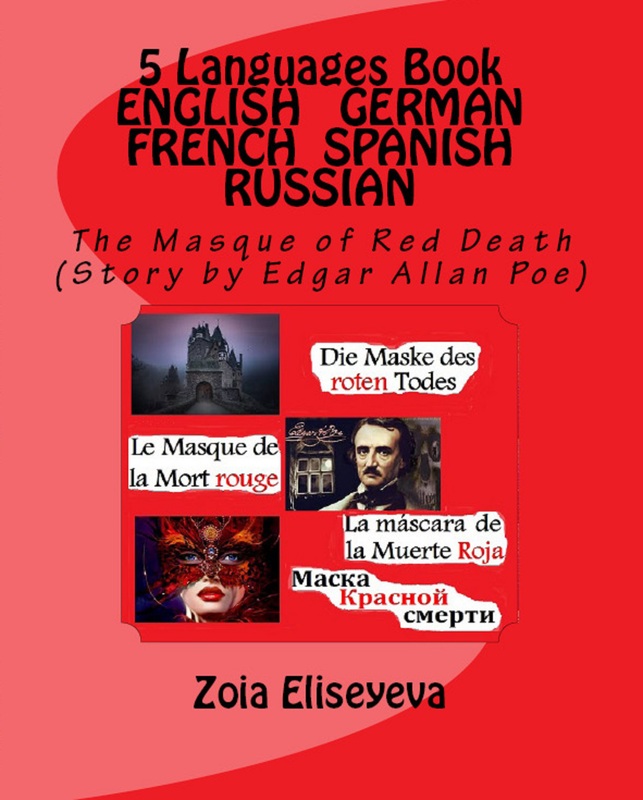 Each page has a paragraph of the story in 3 languages. The book has some cultural notes, and the Supplement in the end of the book gives the comparison of the basic grammatical features of the three languages, as well as the difficulties for students of these languages. 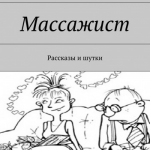 Книга представляет трёх-язычную версию полного рассказа А.П. Чехова “Дама с собачкой”. На каждой странице один параграф текста на трёх языках – русском, английском и испанском. Очень удобно для тех русских, кто изучает англ. и исп. В конце книги обсуждаются грамматики этих трёх языков в сравнении и характерные трудности студентов, изучающих эти языки. Я – русская, преподаю английский в Калифорнии испаноязычному населению почти 15 лет. Испанский изучала здесь (уже 9 лет). Переводы не мои. Я просто составила их вместе, обсудила некоторые моменты Чеховского текста в примечании, и потом сравнила грамматику трех языков, принадлежащих к трем различным языковым группам (славянской, германской, романской). The 1st page of the trilingual book. I came to USA in 1995 with a student’s visa. Before that I had taught English to the speakers of Russian and Latvian for 5 years. It was a short 45-day visa. I met an American and we got married in Las Vegas after three weeks after my coming to USA. All the thoughts and worries I started sharing with my diary notebook. I was adjusting in the new country, and I was describing my adventures in search for work, in my new marriage, in my studies, and leisure. Humorous attitude even to difficulties prevails in the book. It is an easy reading and I share the new words and expressions that I, an English teacher, learned in California. My first entry was published in St. Petersburg, Russia, in 1996 in the magazine “Nataly” by the editor-in-chief Mark Monusov. Every time he published my story he would send me a copy of a beautiful colorful magazine with my story in it. 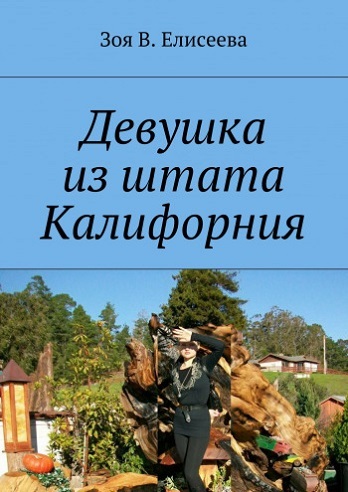 I finished writing the book after I came back to USA from my first trip back to Russia in 9 years, in 2004. My first marriage was slowly coming to an end. 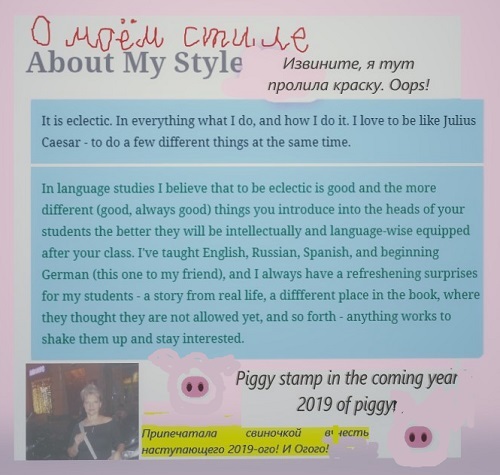 In my last chapter of the book I shared the impressions about Moscow, and Paris, where I visited my French pen pal (we had been pen-pals for 9 years, and now still exchange news on and off). 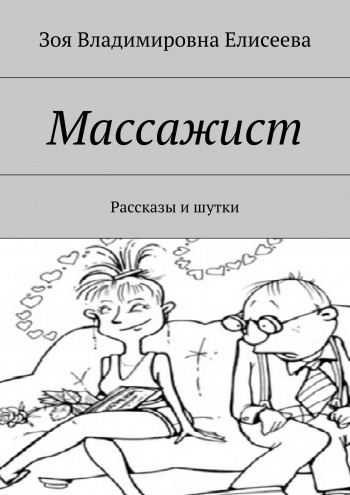 The 2nd Russian covers edition of the book. 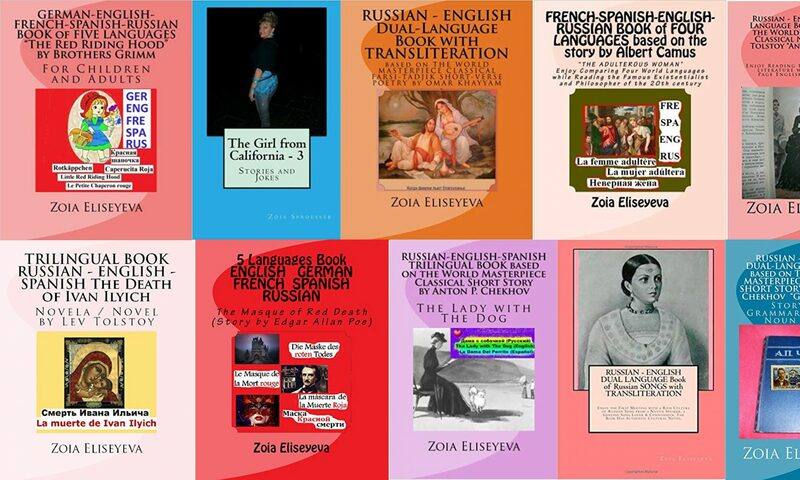 There was one 2010 edition covered with English covers that you can see on the site page Zoia’s Books and that can be easily ordered in USA. Из рубрики – Русские в Америке. Сколько лет надо наблюдать приготовление индюка чтобы запомнить – Кристмас 24-ого или 25-ого? Ну вот через 23 года я еще не запомнила. Спрашиваю. Так и у них все русское между ушей пролетает. Оно им надо, какие у нас традиции или праздники? Не ждите картинки по теме. Индюка все видели. А вот мне фотографий кучи никак не разобрать. Поэтому выставляю, что под руку подвернется. Все организованнее чем в файлах среди туч других фото. Под руку мне подвернулись мои ночные бдения с писаниной и компьютерным творчеством. With me it is often a problem: what language to choose. I know I need to try to write more in English. I live in USA. Who needs my Russian here? However, yesterday I read in one nice article about the 10 main languages in the world, and the author said that Russian has a cute Cyrillic alphabet, and he recommended to study it because he says that only 8-10% of Russians speak English. And because one who knows Russian will understand Ukrainians too! (What an\unusual benefit I thought). I don’t know about Russians and their English, I know about Japanese and English, since I just visited Tokyo this past Thanksgiving-2018. I spoke to many people around. Especially when I was looking for a post-office during a national holiday when all post-offices were naturally closed as they are in USA. Many do not speak English at all. Even the young boys of 17 knew only 2-3 words and could not show me to a movie theater. (It was another day, not a post-office day). Well, I will come back to my topic “what language to choose” otherwise I will get lost again in the narrow streets of Tokyo. 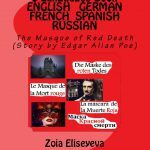 I love to write in Russian, and I need to always remind myself of practicing Spanish. And so there is always this dancing with a few languages. Sometimes I think how much easier is life of a person who just does all his needs in one language. I know many such people! But then I think right away how more interesting is the life of a person who deals with a few languages. It is a more connected life. Connected to more knowledge, connected to the contemporaries who happen to live at the same time. Connected to other places of the world. I know many will say that internet brings them all this connectivity through videos and sites from all over the world. However, to watch in translation is one thing, and to be involved in the communication with people whose language you have studied is a different, quite beautiful thing. I went to Madrid in 2016, where I was eager to find out would my South American Spanish be functional there or not. Yes, it was very functional. I made many friends in a few days I was there. I even helped one Spanish woman to talk on the phone with a hospital in San Francisco about her paperwork. She was very grateful and invited me for tapas. My first tapas in Madrid. With a real Spanish woman. It was interesting. I got my share of difficult adventures there. One of them was that when I was coming by a metro train to the station closest to my hostel that was in the downtown of Madrid, I was lucky to discover that the station is under repairs, and I need to get off at the closest one. This is how I was walking with my heavy carry on through the dark 11PM Madrid full of people celebrating the first Saturday of the week. I never have baggage, but I always have a heavy carry-on. So to complement my special luck for difficulties I have to carry my heavy carry-ons. My favorite purse of the day is heavy even when it is empty. It is a beautiful leather grey classic color rectangular (taller side in vertical) purse, with which I fell in love about 6 months ago before my trip to Siberia. I knew I do not like heavy carry-ons, but I loved the looks of my new purse so much that I decided to suffer the weight. Well, back in Madrid-2016 I had not had this purse, but I had some other that was not light either. OK. I have no idea have I expressed myself enough about how difficult sometimes is to choose the language for my writing, but I know I have commemorated here a few difficulties: the heavy weight of my carry-on, the insufficient English for Tokyo English-speaking tourists, and the special luck for different kind of difficulties, that often turns into something funny. About that I will be sharing in my future posts. The main thing for a person is to have a sense of humor and use it, use it all the time! Without it our lives would be not easy at all! Not a bed of roses at all! Our lives would not be many beds of roses at all! English with it’s subject-verb correspondence! Talking about flexibility of a language. Russian. Very flexible and uses cute Cyrillic. Look how cute it is – кириллица. Ура! Уж время спать, а мы еще не ели (завтрак). Hoorah! I have the first spam comment in my comments box. Somebody from somewhere was talking about carbohydrates. From unknown commenter into the unknown somebody’s site (well, known to me) and back into the big unknown jungle of internet. Now I start thinking that the picture of me near Apollo-13 in Hollywood Studios is a very symbolical one. We live in the unknown and we go to the unknown. And the transport is always ready – the old Apollo 13 with me, quite young on the side, with me, frozen in time near that old Apollo. To the unknown, my friend! S Diego. The little top I am wearing got me under harsh judgment of older women in the group trip to Italy in around 1991 where I was on the mission to guard mi suegra of that time. She was a naughty 40yo who disappeared on me in the train to Bratislava. I found her smoking in a company of a younger man. Adventures of youth! Really? I kept that top for 4 years, really? I must have miscalculated something. The top was snow-white. I came to USA in 1995. I have had a sleepless night, and, hopefully, I have started my site. I know, it looks quite disorganized right now. However, if to remember that a day ago I wanted to cancel my domain, then on that sad background I look pretty good right now. Of course, for a few hours, that I have been working on the site-building, I haven’t even once completely signed out yet – to see how it works just from a general search, but I am very hopeful that it does. As a German saying goes “A good start is almost a half done” (something with that sense) I think this statement is applicable to me now. I bought an inexpensive domain 16 days ago, and yesterday morning I was nowhere. This morning I feel I am somewhere, moving that avalanche of my creations from that frozen situation to “perpetuum mobile”. And to those, who are interested to teach English at Pasadena College, CA, USA, I am enclosing a link to my short video about the job. Some of you, who live in USA, will be surprised at my putting everywhere in my comments and small posts the names of state and country. Well, I am an international person, I can write from two different states in USA, or I can write from my trip abroad. If you are surprised at that, for me it is just convenient to know “what, where, and when”.